Tim Gent shares his passion for cooking over an open fire. Gathering and preparing the wood and kindling, lighting and tending the fire, cooking techniques and favourite recipes are all covered. Backpackers need to travel light whereas others can afford to take along more equipment in their vehicle or canoe. Tim caters for this and suggests different equipment lists and cooking techniques to cover the different approaches. Whether you are planning extended backwoods trips or simply an adventure with your children in the back garden, this book will be an invaluable companion. Growing up on a farm, Tim has enjoyed an outdoor life since childhood. Subsequent work in forestry conservation and archaeology has added to an understanding and ever deeper love of the land. Camping has been a constant feature over the years, with tents pitched from sea level to mountain ridge, from the Mediterranean coast to Arctic Scandinavia. Writing about fishing, hillwalking, canoeing, camp craft and camp cooking, the first of Tim’s many magazine articles was published in 1990. 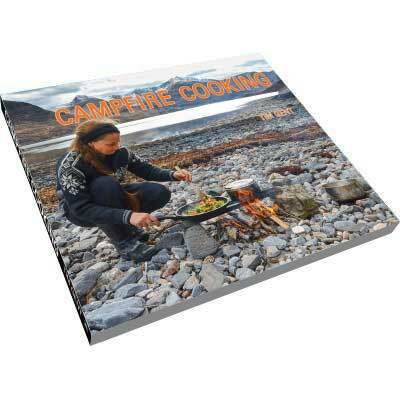 He is a regular contributor to Bushcraft and Survival Skills, Outdoor Adventure Guide and The Great Outdoors, and has written on various subjects for magazines in Europe, Australia, Canada and the United States. His book, Canoe Camping, was published by Pesda Press in 2014. Tim and Susannah met at an informal campsite and they have been pitching a tent at the end of a day’s travel ever since. When not under canvas, Tim and Susannah live in Devon, England, midway between Dartmoor and the Atlantic coast.